A private ecumenical school serving primarily low-income children on Cleveland's near west side will sever ties with the Cleveland Catholic Diocese to preserve a new partnership with MetroHealth. Urban Community School, which was founded in 1968 by the Ursuline nuns in partnership with three Catholic churches on the near west side — St. Wendelin, St. Malachi and St. Patrick — announced this week that its board had "voted overwhelmingly" in October to move ahead with the MetroHealth partnership. This will include a new community health center on the UCS campus, (Lorain Avenue and W. 48th Street), which will provide a broad range of services to students and their families. The plan is to break ground on the clinic in 2019 and begin services in 2020. "Our	hope	was	to pursue	the	clinic while retaining our existing	relationship	with	the	Diocese	and	our	Ursuline	sponsorship," Gill wrote. "Unfortunately,	we	were	informed	that,	given Catholic	teaching,	such	an	outcome was impossible." 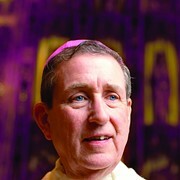 Gill said that religious education would remain a component of the UCS curriculum — in fact, he said they would not pursue becoming a charter school because of the value they place on children's spiritual formation — and that the Ursuline nuns, while discontinuing their formal sponsorship and governance, would be welcome to continue their service at the school and on the board. Among other potential ramifications, the school's CYO membership is up in the air. UCS will lose its accreditation from the Ohio Catholic Schools Association and will pursue accreditation from the Independent	Schools	Association	of	the	Central	States	(ISACS), a body that accredits other area private schools: Gilmour, Laurel, University	School,	Hawken, Hathaway Brown, and Western	Reserve	Academy among them. 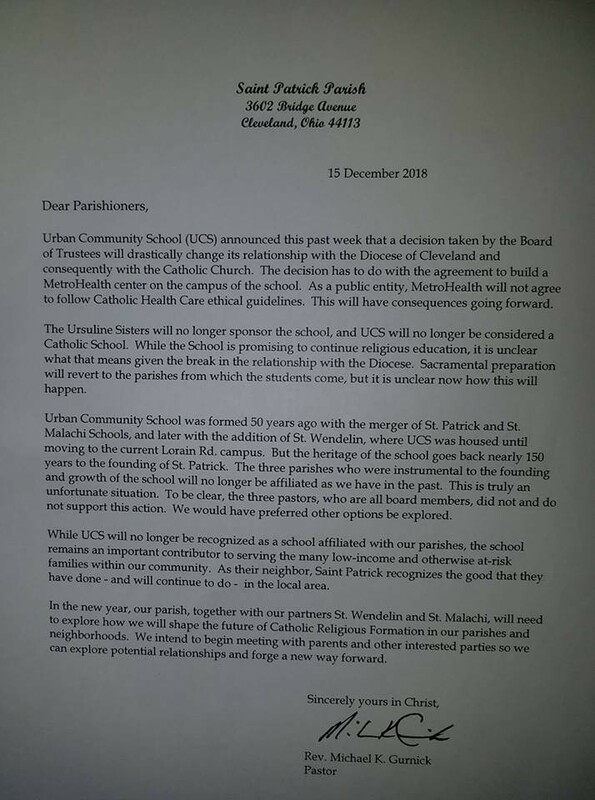 The announcement has been met with mixed feelings by the UCS community, the St. Wendelin, St. Malachi and St. Patrick parishes, and by alumni on Facebook. Some have applauded the school for forging ahead with the clinic, and for recognizing the linkages between health, academic success, and community well-being. Others have lamented the decision, and feel that by ending the formal relationship with the Ursulines and the Diocese, UCS is surrendering an essential element of its identity. Many in both camps are angered by, or fed up with, a Catholic church they see as increasingly out of step. 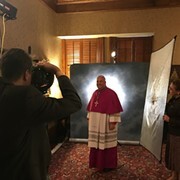 The Diocese responded to Scene's request for comment with a prepared statement, which read in part: "While the Diocese supports the inclusion of health clinics in school environments to ensure that students, families and local communities have access to needed healthcare services, compliance with the Ethical and Religious Directives for Healthcare Services of the Church is vitally important to ensure that healthcare is delivered in a manner that is consistent with the moral teachings of the Catholic Church." The priest at St. Patrick, Fr. Michael Gurnick, distributed a letter this weekend explaining the decision to the parish. He called the UCS board's decision a "truly unfortunate situation." "To be clear," he wrote, "the three pastors [of St. Wendelin, St. Malachi and St. Patrick], who are all board members, did not and do not support this action. We would have preferred other options be explored." Disclosure: The author is a UCS alumnus.